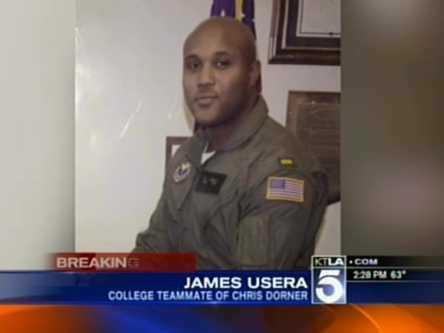 SAN BERNARDINO, Calif. (AP) — It didn’t take ingenuity for Christopher Dorner to elude authorities for six days. He simply opened an unlocked door.As law enforcement swarmed a mountain neighbourhood searching for the fugitive ex-cop, Dorner hid in a condominium 100 feet across the street from a command post and a short distance where he left his burned-out truck. On Friday, San Bernardino County investigators revealed Dorner died from an apparent self-inflicted gunshot wound to the head and defended tactics used during their search before a fiery gun battle ended an exhaustive manhunt. Dorner, 33, is believed to have entered the condo through an unlocked door sometime Feb. 7, soon after he arrived in the resort area of Big Bear Lake after killing three people. He locked the door and hunkered down until the condo’s owners came to clean it, said San Bernardino County Sheriff John McMahon. Deputies knocked on the door that first night but moved on when they found it locked and with no sign of a break-in, McMahon said. “Our deputy knocked on that door and did not get an answer, and in hindsight it’s probably a good thing that he did not answer based on his actions before and after that event,” the sheriff said of Dorner. When the owners went inside the condo, Dorner tied them up and fled in their car, leading to a chase and a shootout that killed a sheriff’s deputy. Police initially weren’t sure if Dorner was killed by one of their bullets or by a fire sparked when they launched incendiary tear gas inside. Now they believe he died by his own hand as the cabin was going up in flames. “When about a quarter of the cabin was on fire, we heard a distinct single gunshot come from inside the house which was a much different-sounding shot than what he’d been shooting at us,” sheriff’s Capt. Kevin Lacy said. Dorner was equipped with an arsenal of weapons, including assault rifles with flash suppressors that masked the sound of gunfire and the location it was coming from as he pelted the first two deputies to arrive at the cabin, killing Det. Jeremiah MacKay. “Our officers had not even pulled their guns out at that point and were not prepared to engage anybody and they were ambushed,” McMahon said. The next five responding deputies got into a fierce firefight with bullets whizzing through trees. They deployed smoke bombs to block Dorner’s view so they could pull the wounded to safety as other officers provided cover with a hail of bullets, said Capt. Gregg Herbert. Worried he was lying in wait to ambush them, they eventually used heavy machinery to peel back walls and windows to see if they could see Dorner, who used smoke bombs to obscure their view. They eventually resorted to the tear gas, though McMahon said they didn’t intend to start the fire. The search for the former cop began last week after authorities said Dorner launched a violent revenge campaign against the Los Angeles Police Department for firing him, warning in an angry manifesto on Facebook that he would bring “warfare” to LAPD officers and their families. The former Navy reservist was dismissed for filing a false report that accused his training officer of kicking a mentally disabled man. His first victims were Monica Quan and her fiance, Keith Lawrence, both gunned down outside their Orange County condominium Feb. 3. Quan was the daughter of former LAPD Capt. Randal Quan, who Dorner said he felt represented the department’s interests over his own before a disciplinary board. After ambushing and killing Riverside police officer Michael Crain and seriously wounding his partner at a traffic light, Dorner fled to the San Bernardino National Forest, about 80 miles east of Los Angeles. His burned-out truck, with a broken axle, was found within walking distance of the Big Bear Lake condo. Dorner entered the condo through a door left unlocked for a maintenance man, McMahon said. He locked it and stayed there as officers went door-to-door checking vacation cabins and condos and used heat-seeking helicopters and metal detectors to search for the fugitive in the forest. It was the condo’s owners, Karen and Jim Reynolds, who finally found Dorner when they arrived Tuesday and unlocked the door that they assumed the maintenance man had locked. Dorner pointed a gun at them, tied them up and fled in their purple Nissan Rogue SUV. “I really thought it could be the end,” Karen Reynolds said afterward. Even though she was bound, she managed to call 911 moments after he left.